A trumpet produces the highest notes of any instrument in the brass family. As these instruments age, the brass finish will begin to deteriorate. The cost for a professional to strip and reapply lacquer to a trumpet can be quite high, but doing this activity yourself can be more financially appealing. Set aside four to five hours to complete this task. Fill your bathtub with hot water and add in half a cup of liquid laundry detergent to help you remove some of the old lacquer from the trumpet. The bathtub doesn't need to be entirely full, as your trumpet only comes so high once placed on its side. Remove all valves and slides from your trumpet so that all parts can settle in the soapy water. Gently lower the trumpet and all brass parts into the water and let them soak for about three to four hours for thorough cleaning. This soapy water will help you remove the main finish on the trumpet. Pull the trumpet and all of its parts carefully out of the tub and onto a towel. Open the packaging for the paint stripper and read the instructions so that you can completely remove any remaining lacquer left on the trumpet. 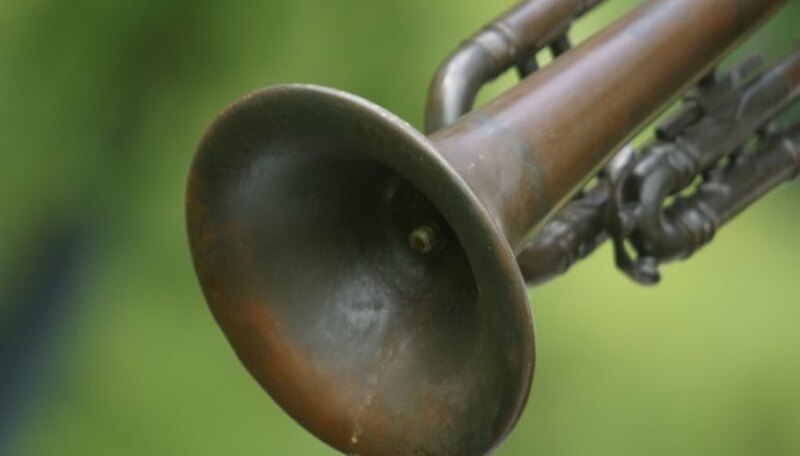 Use a wire brush and stripper to scrub away any remaining flakes of finish that still appear on the trumpet. Let the trumpet dry completely after you have removed all of the brass finish. If you do not want to wait, wipe the trumpet with a lint-free cloth until thoroughly dry. Brush on the new brass lacquer very carefully, ensuring that you do not get any excess lacquer inside any of the slide or valve openings. Lacquers also come in spray form, so this makes spreading it a bit easier. Make sure you cover the entire trumpet thoroughly, then place on a towel to air dry.